Thanks to the onslaught of the ‘Fitness Revolution’, we have all become incredibly aware of the adverse effects of an obese body and an unhealthy lifestyle. Given the sedentary pace of our daily lives, it is natural to put on some pounds, but if this exceeds a particular level, it causes a host of illnesses and disorders. Without some form of exercise or physical activity, your body won’t be as adept at fighting away illnesses as it should be. While that was one reason to get fit, another great reason is also how a fit and toned body boosts your confidence. After all, who hasn’t felt a little self-conscious about problem areas on their body? For some of us, it is the stubborn belly fat that doesn’t go away no matter what we do. For others, it may be jiggly arm fat. Maybe for some people, it is the thigh and hip region. No matter what part of your body you feel conscious about, there is a solution for it with Yoga. Yoga is the ancient Indian practice combining physical poses (called asanas) and stretches with meditation and breathing exercises. Although yoga dates back many centuries, it has gained popularity among people across the globe in modern times. In fact, the ancient techniques of yoga have been combined, and fusion versions such as Hot Yoga and Power Yoga have taken on the world of fitness. Regularly practising the art of yoga helps in promoting a healthy sleep pattern as well as appetite and mood. Moreover, it has a host of benefits to offer those who wish to lose weight healthily. 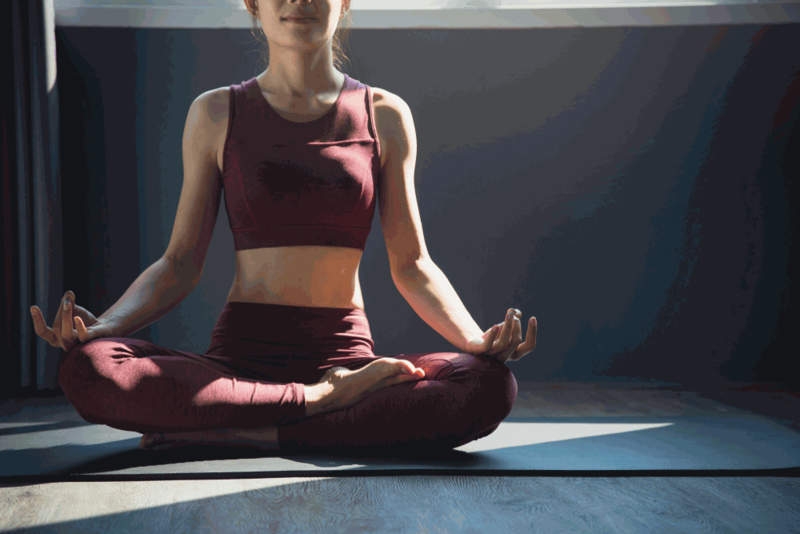 The breathing techniques and meditation tips are useful for de-stressing as well as for controlling your mind. The other benefits of yoga include a regularized metabolic rate, increased body flexibility, improved digestion, even prevention of injuries and quick recovery from any injuries. Right from athletes and professionals, to young people and older ones, yoga has benefits to offer to all its practitioners. When it comes to burning fat from the hip and thigh region, some yoga poses effectively work on this area to make it slimmer. When combined with a balanced diet and workout routine, these poses can help blast away fat from your problem area. Apart from helping you reach your weight loss and toning goals, yoga poses to burn hip and thigh fat will also help with relaxation, improved digestive health, and stress reduction. Now that you understand the value of yoga to your weight loss endeavors let’s take a look at some asanas that can help slap your hips and thighs into shape. The Chair Pose is also known as the Lighting Bolt Pose, and in the case of Bikram Yoga, it is known as the Awkward Pose. Akin to sitting in an imaginary chair, this pose is one of the most effective ones when it comes to knocking away fat from the hips and thighs. To start with, stand erect in the Tadasana position. Once you are in this position, bend your knees gently and lower your hips. The aim is to position yourself as though you are sitting on an imaginary chair. Stay in this position for 15 to 20 seconds and monitor your breathing. Make sure that you breathe normally, and don’t exert yourself. Once you are done. Release from this position and go back to Tadasana. The chair pose effectively stimulates hip and thigh muscles, helping in your goal of fat loss in the region. While sitting on a real chair is the easiest thing in the world, maintaining that pose without the chair gives an excellent workout to the muscles in the thigh and hip area. Your body weight is sufficiently concentrated on this area, toning the leg and ankle muscles as well as the gluteus. With regular practice, you will see that your back pain, as well as any knee pain, reduces. If you have arthritis, chronic knee pain, inflamed joints, or chronic back problems, avoid practising this asana. Refrain from the Chair Pose if you have low blood pressure or damaged ligaments. The Came Pose is an asana that enables you to stretch in a backwards direction, and the resultant abdominal stretch is effective in toning your muscles. Any tension build-up in your body is released with the regular practice of this pose. Start by sitting in Vajrasana, and then slowly lift up the body from your knees. It should be so that you are sitting with your body’s weight perched on your knees. Your heel should remain perpendicularly oriented to the ground. Once you are in this position, deeply exhale and then arch your back. Then slowly and gently reach out and hold your ankles, one at a time. Tilt back your head, stretching in a backwards direction till you feel a gentle pull in your abdomen and hips. Hold this position for 20 to 40 seconds while breathing normally. Afterwards, exhale slowly and gently return to your starting position. Relax for 15 to 30 seconds before each repetition. The Camel pose effectively opens up the body’s your pectoral muscles as well as the hip flexors. By doing so, it works on toning your limbs, frontal thighs and even the abdomen. Even further, if you are really dying for a well shaped hip, try the yoga burn booty challenge. Regularly practicing the Ushtrasana is known to aid in posture improvement as well as strengthening of back muscles. This pose can relieve any menstrual discomfort or mild cases of back pain and fatigue. Additionally, it can also aid in blasting away belly fat. People with heart ailments or chronic neck pain should avoid this pose. Similarly, people with high blood pressure, migraine, or insomnia issues should not perform the Camel Pose. We can easily say that in modern times, Natarajasana has become widely recognized as a yoga move. This asana is a balance pose and is extremely useful when it comes to improving the overall balance (physically and even personality-wise) of those who regularly practice this asana. This is one of the most Instagram-friendly poses, and that’s why it is not uncommon to see many famous yogis on social media performing this picturesque asana. Begin by standing in Tadasana and then shift your weight to your right foot. Lift up your left heel and guide it towards your left buttock. At the same time, press the right-side thigh bone into your hip joint. Simultaneously, pull up the knee cap to ensure that the left leg stands straight and strong. After this, reach back with your left hand, while keeping your torso upright. Grasp the outer side of your left ankle or foot. Actively lift the pubis closer to the navel to avoid any compression in the lower back. At the same time, keep your tailbone pressed down towards the floor. Now lift your left foot in an upward direction away from the floor and away from your torso. Simultaneously, extend your left thigh behind so that it is in a parallel direction to the floor. While doing so, stretch the right arms ahead so it is in front of the torso and parallel to the floor. Remain in this position for 25 to 40 seconds. Afterwards, release your foot and place it on the ground. Take a short 15-second interval and repeat. In the case of this asana, hip flexors get stretched and stimulated, encouraging activity among the inner as well as outer thigh muscles. As the body is balanced between one leg and the other, it strengthens the Corpus Callosum and improves the body’s balance. Additionally, this pose also opens up your hips, releasing any energy blockages. Most people can do this asana, even if it may not be perfect on the first try. However, if someone has severe knee or back problems, it is best to refrain from this asana. The Warrior Pose is derived from the word Virabhadra. This is the name of a fierce warrior who was also an incarnation of Shiva. This pose is well-known for its ability to increase stamina and make the practitioner strong. Additionally, this pose is also known to work on toning the hips as well as thighs, by strengthening the muscles. To get started, widen your legs so that they are slightly wider than hip-width. Now, twist the right heel in a way that your toes point outwards. Use the left heel for grounding yourself. Ensure that the left heel’s arch is in line with your right foot. Lower your hips till you feel the arm area stretching out. When you stretch your arms, imagine yourself radiating energy. In this same position, gaze straight ahead and hold this pose with minimal fidgeting, for around 30 to 60 seconds. For a more intense effect, widen your legs wider than hip-width and go lower with your pelvis position. Remember that you mustn’t sacrifice balance or form in this bargain. As you maintain this position, breathe purposefully, yet slowly. When you release from this asana, take a 15-second interval before you repeat. While this variation of the Warrior pose is useful in toning the legs, it focuses specifically on the inner thighs. The inner thigh muscles usually get ignored in the course of our daily routine, but this pose helps in stimulating those muscles for totally toned legs. Additionally, this pose is known to aid with relieving back pain, especially the type of back pain that accompanies the second trimester of pregnancy. If you have any chronic neck pain, diarrhea or high blood pressure problems, refrain from performing this pose. Upavishtha Konasana is considered as an excellent preparatory pose for other seated bends and twists that you may perform. However, when it comes to getting your thighs and hips in shape, there is hardly a more effective asana. To begin this pose sit with your legs opened up in a 90-degree angle about your pelvis. Now, point up the toes to the ceiling to flex your feet and align them with your knees. Rotate your thighs in an outward direction, pinning them to the floor and keeping your kneecaps pointed straight up towards the ceiling. Stretch out your heels and soles, pressing down on the balls of your feet. Now, keep your arms elongated and begin moving forward. Make sure you bend forward from the hip joints and that you maintain this throughout the movement. If you are turning from the waist, stop and realign your bend. When you bend, exhale completely and once you’re in the right position, breathe gently. Stay in this pose for up to one minute. Inhale deep when you release. The Seated Wide-Legged Forward Fold works wonders for the muscle in your upper legs. Apart from stretching these muscles out, the asana also works on toning the thighs. This asana is known to detox the kidney and help in regaining strength and flexibility. Additionally, those with sciatica and arthritis will be helped tremendously with regular practice. If you have a tear or muscle pull in the hamstring or groin region, avoid this asana. Additionally, pregnant women, people with herniated disks and severe spinal problems should refrain from this pose. The Boat Pose is undoubtedly one of the most popular poses when it comes to achieving a flatter belly and toned abdominal muscles. However, it also has a variety of applications when it comes to shaping up the hips and thighs. It even helps your core muscles develop in a manner that makes your entire structure stronger. Lie straight down on the floor with your legs stretched out, and your toes stretched out towards the ceiling. Keep your arms on either side of your body, with the palms resting towards the body. Now, inhale deeply. As you begin to exhale, gently lift your body from the ground, first by raising the head, followed by the chest, and then your legs. Stretch your arms out so that together they form a parallel line with your legs. Keep your fingers on the same level as your toes. As you continue in this position, you will feel the contracting of your abdominal muscles. Stay in this position for 30 to 60 seconds, breathing in and out regularly. Inhale and exhale gently, and then release your body from this position. Gently bring back your body to the starting position. The main advantage of Naukasana is geared towards burning belly fat. However, it also aids in eliminating fat deposits from the thigh and hip area. Moreover, it strengthens the muscles of the thighs, glutes, back, shoulders and arms. For people with a hernia, this asana has many benefits. In case you have diarrhoea or any abdominal discomfort, it is best to stay away from practising this pose. Additionally, menstruating or pregnant women must refrain from this asana. The Head to Knee Pose is a formative part of Ashtanga Yoga. This seated asana is called Head to Knee as the head touches the knee while the pose is in full form. While it may sound like Janu Sirsasana might be similar to Sirsana, the two yoga asana have nothing in common. Janu Sirsasana has a host of benefits to offer those looking to blast away fat from the hip and thigh region. Start by sitting on the floor with your back fully erect. Stretch your left leg entirely from the hip joint. Now, bending your right knee, place the right foot’s bottom against your inner left thigh. This means that your right leg and knee must be pressed against the floor comfortably. Additionally, your navel and chest should be aligned with the left leg. Use your hands to offer support by resting them beside the hips. Now inhale, extend your belly and torse right up. While exhaling, let the energy run down through your left leg, reaching the ball of the foot. Now, inhale and stretch your arms to elongate your spine. When you exhale, bend forward from the base of the hip, reaching out for the toes. If you are a beginner, you may aim for the ankles. Hold this pose while breathing in slowly and deeply. With each breath, feel your groin area releasing any stress. Move on to the back of your left leg and along the entire back area, feeling each muscle relax. Inhale and release your body from this pose. Slowly return to the starting position. Janu Sirsasana works increases mobility and flexibility in the thighs and hip joints. The muscles in this region are stretched during the asana, and circulation of blood and oxygen improves. Additionally, muscles in the groin, shoulders, and hamstrings get a good workout. With regular practice, people with insomnia, high blood pressure and sinusitis have found many benefits. If you have any serious lower back injuries or pain, lumbar disc herniation or asthma, refrain from performing this pose. These yoga poses to get your hips and thighs in shape are highly effective in toning and fat reduction. They also have a host of other benefits to offer people who regularly practise. While yoga poses have a lot to offer those who wish to have a stronger, fitter, healthier and more flexible body, you can’t rely on it alone. These poses show their best effect when combined with cardiovascular exercise, a healthy diet, adequate amounts of water, and proper rest.